New state-of-the art 5 LED light and all the accessories needed for a wonderful teeth whitening experience. Only a few easy steps and items to help reduce sensitivity. This simple at-home product can be used at your convenience. Don't use if pregnant, lactating. Also don't use if you have loose fillings, unhealthy gums or teeth. 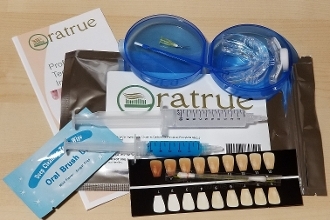 Also if you have any white fillings, crowns or veneers in the front the bleaching gel will not whiten these restorations and it is advised that this kit not be purchased.